I want to get my homocysteine levels in check with L-methylfolate and its biochemical "helpers." L-Methylfolate, pure and simple. You will get a high quality, pure, professional-strength L-methylfolate, without any fillers or food allergens. Compare this L-methylfolate to the active ingredients in Deplin. Because it only contains L-methylfolate, you can easily add it to your existing nutritional regimen, remove it from your regimen, or modify the dose. 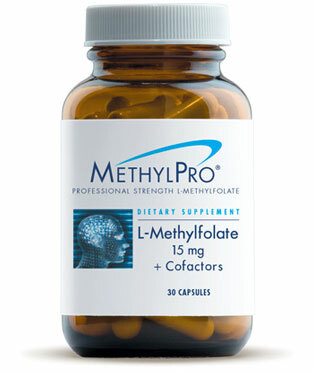 L-Methylfolate + Cofactors was specifically designed to promote normal homocysteine levels and healthy folate metabolism. It combines the active form of folate with the activated forms of vitamins B6 and B12, as well as magnesium. Homocysteine is an amino acid that, at high levels, has been linked to cardiovascular disease. The nutrients in L-Methylfolate + Cofactors support the body’s natural biochemical pathways that prevent homocysteine accumulation. L-Methylfolate and vitamin B12 work together to recycle homocysteine to its parent molecule (methionine), so that it doesn’t build up in the body. Vitamin B6 helps to convert homocysteine into other healthy amino acids. Magnesium regulates homocysteine in the methylation cycle and converts homocysteine into other necessary amino acids in the body. B Complex + L-Methylfolate, formulas are ideal for people who need L-methylfolate together with a broad-spectrum B vitamin. This formula contains active forms of all the essential B vitamins, which are readily used by your body and perfectly complement the active form of folate. B vitamins are not stored in the body, so we need to get them through food and supplements on a regular basis for optimum health. Our B-Complex Plus is a bestseller with doctors and helps to cope with stress, promote metabolism, create energy, and support nerve health. It is a great addition to your wellness care if you are not regularly taking a high-quality multivitamin, because it provides all of the B vitamins in a single capsule. Vitamin B1 (thiamin) is critical for energy production in every cell of the body. Vitamin B2 (riboflavin) helps to make energy, create folate, and helps to clear toxins and neurotransmitter waste from the body. Vitamin B3 (niacin) is required for all of the most basic biochemical steps in metabolism (oxidation and reduction). Niacin can lower cholesterol and it helps to create mood-enhancing amino acids, fatty acids, and steroids. Pantothenic acid (vitamin B5) helps to make fatty acids, make energy from food, and it is used in the production of hormones, and vitamins A and D.
Vitamin B6 is needed for thousands of enzyme reactions in the body. It helps break-down amino acids to turn them into neurotransmitters. Vitamin B12 makes energy, DNA molecules, and healthy red blood cells. It works with L-methylfolate to lower homocysteine in the methylation cycle. MethylPro formulas are available in different strengths (from 2.5 mg to 15 mg). Talk with your doctor about the dose of L-methylfolate that is right for you. Young SN. Folate and depression--a neglected problem. Journal of psychiatry & neuroscience : JPN. 2007;32(2):80-82. Scholl TO, Johnson WG. Folic acid: influence on the outcome of pregnancy. Am J Clin Nutr. 2000;71(5 Suppl):1295S-1303S.